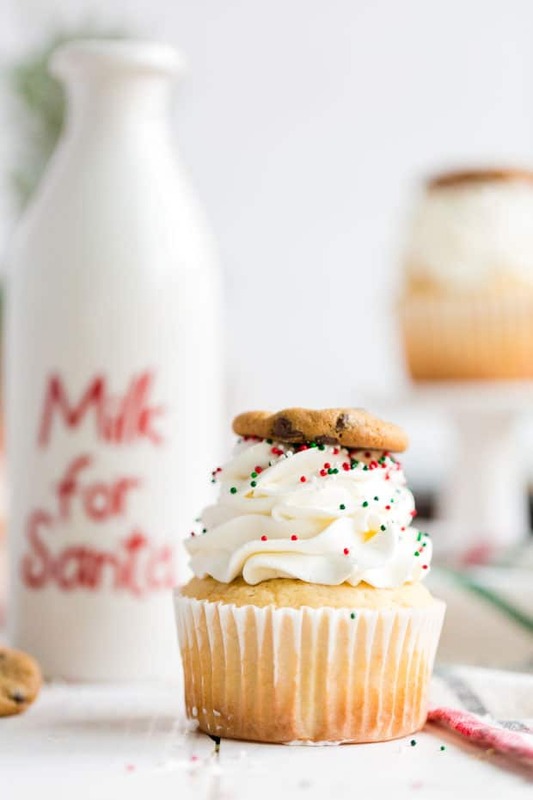 These cookie dough cupcakes are the perfect way to welcome Santa! Delicious, homemade, cookie filled vanilla cupcakes are the perfect sweet treat. A rich, chocolate chip filled dough makes the best filling for a yummy, fresh cupcake. Topped with sweet frosting, everyone will love them. 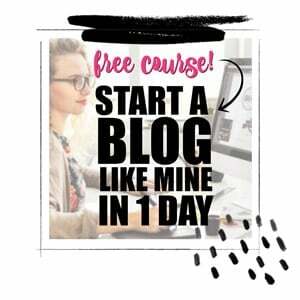 I’m happy to bring you this original recipe as part of a sponsored series. I have always, always loved everything about the holiday season. But this year, I’m even more excited. It will be the first year that my niece, Mary Grace is part of our family. 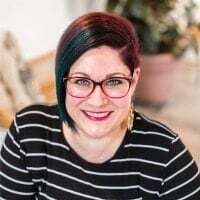 The holidays became extra amazing after my boys were born and now I’m looking forward to the boys being able to share the memories with their precious little cousin. And really, what’s better than a sweet little baby to snuggle with during this magical season?! Absolutely nothing! 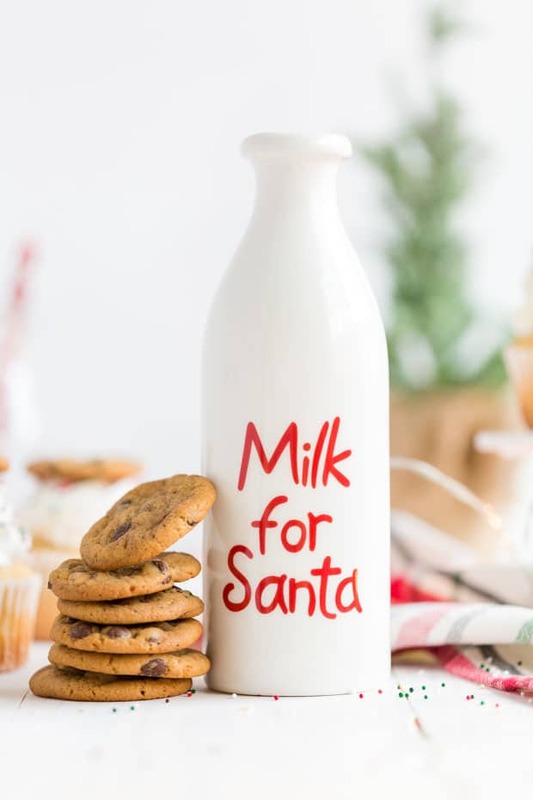 I’m dreaming up all the ways I want to make Christmas special for our family this year. I’m excited to get preparations under way! One of my favorite yearly traditions revolves around Christmas Eve festivities. Everyone in our family gets new, matching pajamas to wear Christmas Eve. We get started early in the evening, so we have plenty of time for all fun. First up is a dinner entirely made of finger foods and appetizers. And let me tell you, it’s one of my favorite meals of the whole year. Some of the recipes are treats we only make once a year. After dinner, we snuggle and read a Christmas book. We let ones of the boys choose the selection each year. Then, the other boy gets to choose the Christmas movie we’ll watch together. My boys love leaving the treat out. We actually choose a different goody each year and it’s a highlight for the boys to get it ready. We recently had a fabulous family vacation. When we got home and I started daydreaming about holiday plans, I knew I wanted to incorporate a yummy cupcake somehow. Then I remembered these incredible chocolate chip cookie dough cupcakes I had one afternoon while traveling. I thought they were amazing! I knew they would be the perfect option for our Christmas Eve treat. When I asked the boys, it was a unanimous yes! I decided to head to Sam’s Club to stock up on supplies for our cupcakes. I love that they have great value and big sizes available for everything I need. Here’s what you’ll need for each component of this amazing dessert. 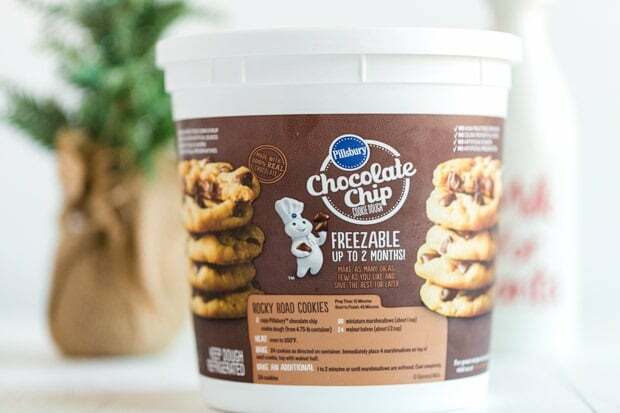 For the mini chocolate chip cookies, you’ll need Pillsbury™ Cookie Dough. Before holiday baking, I always stock up at Sam’s Club. I love that their large quantities mean I don’t have to run back and forth to the store extra times. I could seriously eat the entire tub of this cookie dough all on my own! To make the cupcakes, you’ll being with a medium bowl, sift together flour, baking powder and salt and set aside. In a large bowl, cream together butter and sugar. Add eggs 1 at a time and mix until smooth. Mix in vanilla. Slowly add the dry ingredients into the butter and sugar, alternating with the milk. Mix until just combined. Scoop into jumbo muffin tins lined with cupcake wrappers. Bake at 350 degrees for 25 minutes. Remove from oven and let cool. While cupcakes are baking make filling frosting and mini chocolate chip cookies. For the filling: whip together butter, sugar, flour, vanilla and molasses until light and fluffy (about 2 minutes). Stir in chocolate chips and transfer to a piping bag. For the frosting, use a small bowl, add 2 tablespoons water and sprinkle 1 teaspoon gelatin and whisk together. Let sit for 1 minute. Place in the microwave for 20 seconds. Remove and whisk, making sure the gelatin is completely dissolved. Slowly whisk in 2 tablespoons of the whipping cream to the gelatin. In a stand mixer fitted with whisk attachment, add powdered sugar, the rest of the whipping cream and vanilla. Whip on high until the whipping cream starts to thicken. Slowly drizzle in the gelatin and continue whipping until stiff peaks form. Transfer to a piping bag. For the mini cookies, you’ll scoop cookie dough into 1 inch balls and divide in half. I used a standard size cookie scoop to scoop of the dough and then divided it in half. Roll into balls and place on baking tray lined with parchment paper. Bake at 350 for 7 minutes. Remove from oven and let cool. 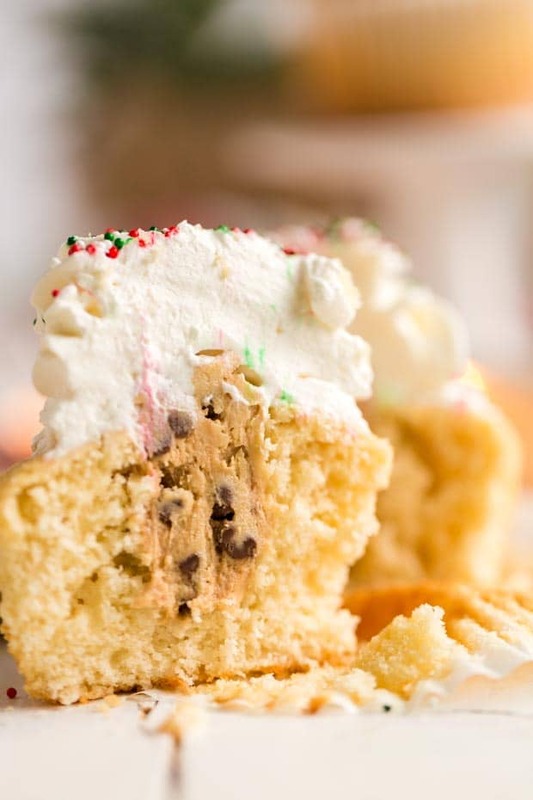 Take a knife and cut out the center of each cupcake cake and fill with edible cookie dough. Pipe whipped cream frosting on top. Add sprinkles and top with a mini chocolate chip cookie. I think these cookie dough cupcakes turned out beyond darling! I can’t wait to make them again for Christmas Eve. The boys are so excited to leave them out for Santa. 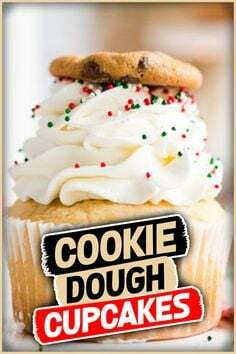 I hope your family will bake and enjoy these cookie dough cupcakes as well. Our unique take on this classic vanilla cupcake recipe will make your mouth water! 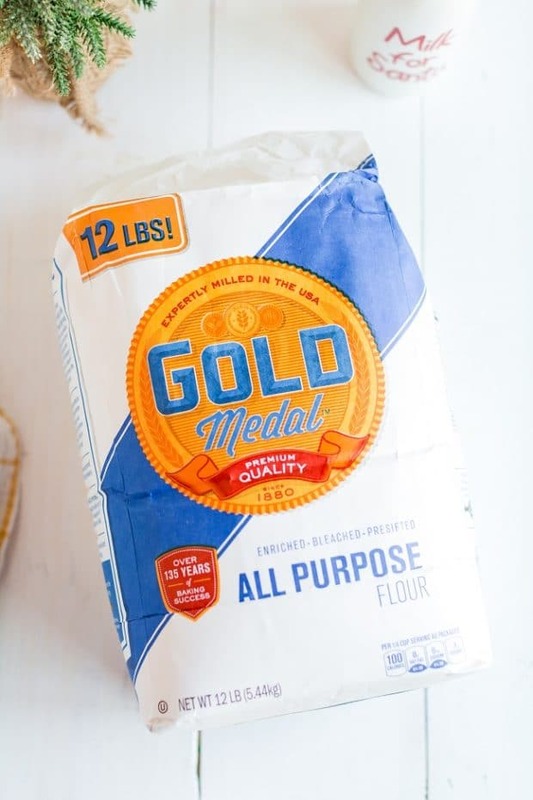 In a medium bowl, sift together flour, baking powder and salt and set aside. For the mini cookies:Scoop cookie dough into 1 inch balls and divide in half. I used a standard size cookie scoop to scoop of the dough and then divided it in half. Roll into balls and place on baking tray lined with parchment paper. Bake at 350 for 7 minutes. Remove from oven and let cool. To assemble: Take a knife and cut out the center of each cupcake cake and fill with edible cookie dough. Pipe whipped cream frosting on top. Add sprinkles and top with a mini chocolate chip cookie. 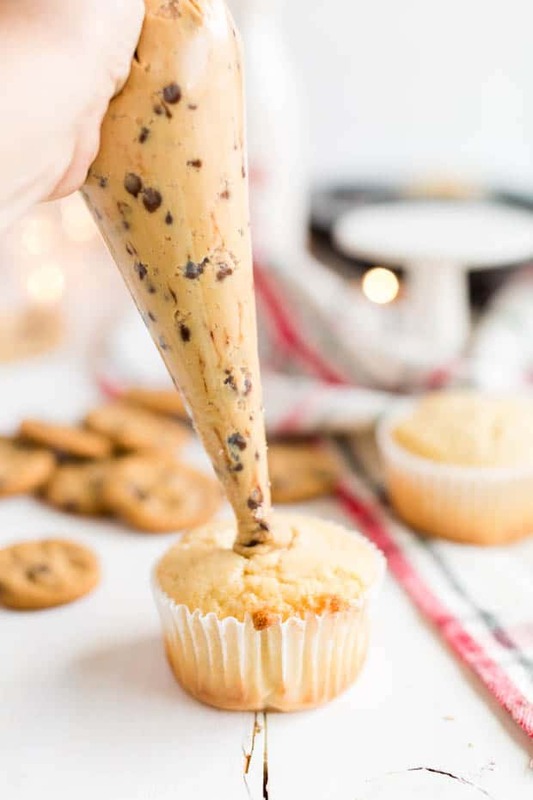 This delicious chocolate chip cookie dough is edible -- perfect for serving or filling cupcakes! Whip together butter, sugar, flour, vanilla and molasses until light and fluffy (about 2 minutes). Stir in chocolate chips and transfer to a piping bag. You'll want to eat this delicious frosting with a spoon it's so good! In a small bowl, add 2 tablespoon water and sprinkle 1 teaspoon gelatin and whisk together. Let sit for 1 minute. Place in the microwave for 20 seconds. Remove and whisk, making sure the gelatin is completely dissolved. Slowly whisk in 2 tablespoons of the whipping cream to the gelatin. Awesome! Soo delicious! My son love it. OMG! These were perfectly delicious!